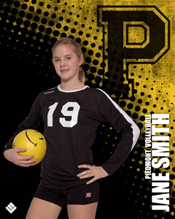 We offer a comprehensive line of products for your volleyball program. Our designers take individual poses and create one of a kind heirlooms for your players. Photographs are printed on Kodak Metallic Paper, and are available in sizes up to 30 X 40 inches. Our designers create stunning custom groups from individual poses for out WideBody Groups™Star WideBody Groups™ are created from one player in multiple poses.